These Maps Show Which States Are the Most Physically Active #infographic ~ Visualistan '+g+"
Physical activity is an essential part of a healthy lifestyle. According to several studies, adults should aim for 150 minutes per week of moderate aerobic activity, or 75 minutes of vigorous aerobic activity. Combining that with a strength training regimen, such as yoga, bodyweight exercises, or weight lifting, can help a typical adult complete a well-rounded fitness routine. This graphic breaks the physical activity of each US state down by the percentage of residents meeting the aerobic activity criteria, as well as a separate breakdown for strength training. There is also a breakdown for the most and least active major metropolitan areas throughout the US. This allows readers to see how physically active their area is, in relation to the rest of the US. This can be especially helpful if you are into fitness and are considering moving to a new location. 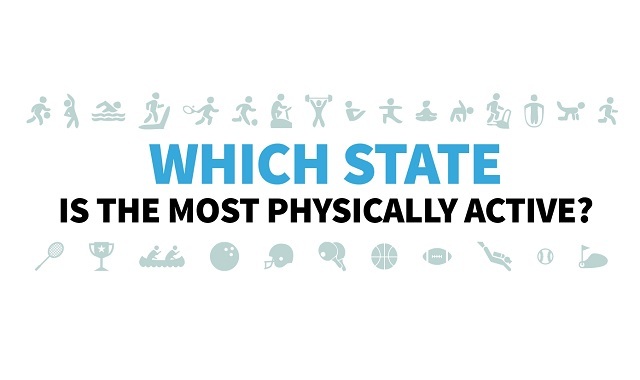 Use this graphic to see how physically active your US state is today!